I’m currently working on a theory about the relative prices of eating out here in India. After a couple of weeks here we’ve been in big cities and small cities. Touristy places and less touristy places and we’ve been trying to come up with an explanation of the wide range of cost on what is basically the same food. Here’s my theory: If you get a fork, you just paid too much for your meal. Most Indians eat with their fingers or whole hand (right hand only). They either dump their curry on top of rice and mash it all up before picking it up (Southern Indian Style), or scoop it up with bread (N. Indian Style). So the locals almost never use western utensils, and if you eat in a “locals” only type restaurant chances are you won’t get a fork without asking for one. Now, places that cater to tourists tastes (and budgets) will include a fork when you get you’re food, and generally it will run a few dozen rupees extra to get exactly the same food. 1 – If you get a fork without asking for it – You paid too much for your meal. 2 – If you ask for a fork and get one – You may have paid too much for your food. 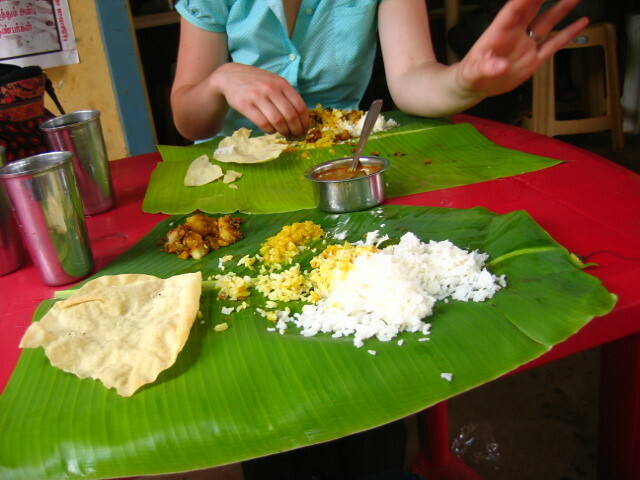 3 – If there are no forks to be had, and/or people are eating off of banana leaves (This will only happen in the South) – Congratulations you scored a bargain.